Apply today for the 2019 inaugural pilot WISE Sports Leadership Program! 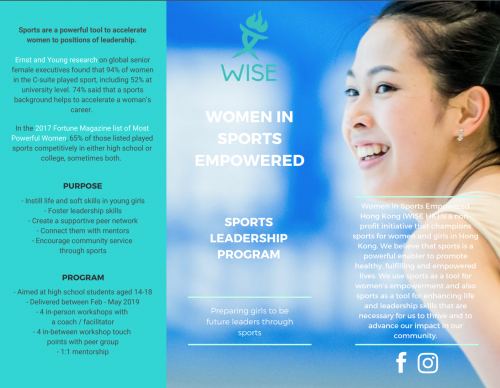 Women In Sports Empowered Hong Kong is excited to announce that we will be piloting our WISE Sports Leadership Program in Hong Kong from February – May 2019! This program will be delivered and implemented ourselves, with collaboration and coaching facilitated by Rachael Lau, founder of ByoBeat. The Program will bring together girls from different schools, and serve as a platform for student leaders to develop their leadership ability, and to understand their leadership style. This inaugural pilot^ program will be delivered over four monthly in-person workshops, facilitated by a coach in English. There will be practice of the skills outside of the workshop, followed by peer group discussions and mentoring sessions. Students will be paired 1:1 with a mentor, as well as work with a coach to develop and enhance social emotional capabilities. Are you a high school student and interested in joining the program? Apply here. Know a high school student who would benefit from this program? Nominate her here. Want to be a Mentor? Go here. WISE HK champions sports for women and girls. We use sports as a tool for women’s empowerment, and to dispel gender stereotypes. We 1) educate why sports matter, 2) empower women and girls through organising sports activities, and 3) connect women and girls in sports to build community. We believe in the power of sports to accelerate women’s life and leadership skills that enable them to thrive and advance their impact in their community. Our theory of change and belief is that sports are a powerful tool for personal empowerment. They are especially important for women and girls to develop and enhance skills and mind-set that enable us to thrive. We believe that by promoting all sports to women and girls in Hong Kong, by providing more access and by encouraging and coaching them to play different sports, we will foster their lifelong participation and enjoyment of and in sports. This will translate into achieving higher levels of social-emotional competencies such as emotional and mental resilience, self-esteem and self-awareness, as well as higher levels of life skills attainment, leading to higher personal satisfaction, and personal impact in their community economically, healthily and participatively. Rachael works with clients in all walks of life – from the corporate and sporting environment to schools and the wellness industry – and boasts extensive experience in the Fitness and Health industries. 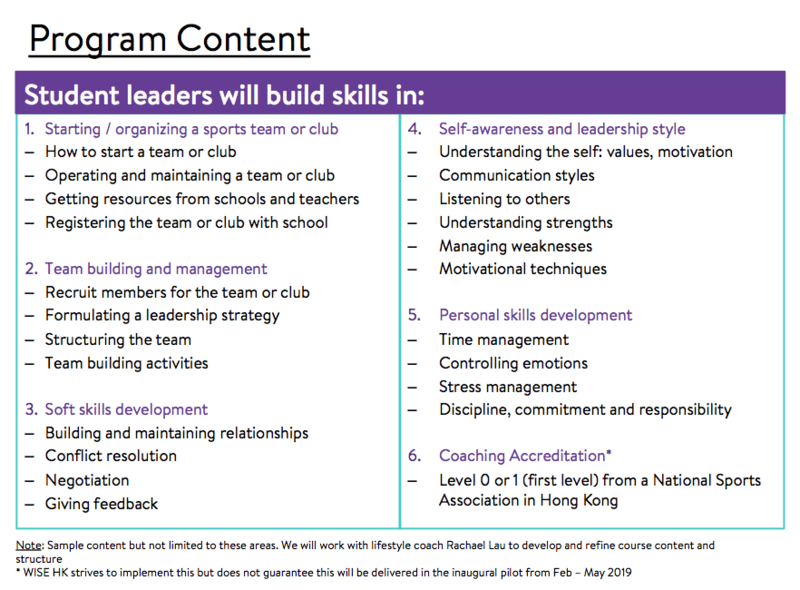 A member of the Hong Kong Women’s Field Hockey team for five years, Rachael’s professional and personal experience with elite sport provides a great foundation for delivering the key components of performance and well-being to teams and individuals. For some examples of how she works with clients, go here. ^ In this inaugural pilot, the program will be condensed to four months. The full program when launched is expected to be seven months with seven monthly in-person workshops.